Gardeners at Paignton Zoo have created a secret, shaded garden in the woods for visitors to discover. Described as being like a little show garden, this is an oasis of calm - despite being between the southern cassowary, an emu-sized bird that can kill with a kick, and the Sumatran tigers…. The project was led by gardener Jason Knight and took months to complete in between other duties. The centrepiece is a handsome carved seat, which – extraordinarily - is his very first attempt at chainsaw carving. Jason – who is marking 30 years at Paignton Zoo - also used an angle grinder and a lot of elbow grease to achieve the smooth shape of the finished piece. Paignton Zoo Curator of Plants and Gardens Giles Palmer explained: “This part of the Zoo was looking like it needed a change. A large ash tree came down last year, which opened up the area and gave us a real incentive to do something new. “This is essentially a small woodland garden. The plants reflect the woodland setting and there are some nice features for native wildlife, like the log wall with living roof. The small, winding pathway allows visitors to get closer to the plants.” These include tree ferns Dicksonia antarctica, Acer, Acer Sango-Kaku, Japanese aralia, Fatsia japonica, loquat Eriobotrya japonica and woodrush, Luzula. The large established trees here are generally native, but the understory planting of shrubs and small trees is more exotic, in keeping with the nearby animals. The seat, bench and bridge are all carved from a cedar tree that was taken down in the Zoo a few years ago. 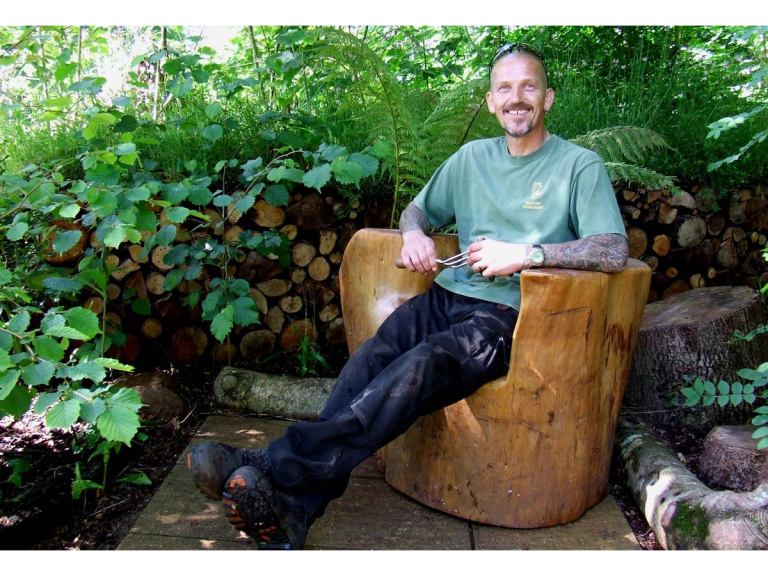 Jason made the carved seat while The Whitley Wildlife Conservation Trust Reserves Warden Dave Ellacott made the bridge and bench. If this mini garden proves popular with visitors and copes with a busy summer season, then Giles will certainly look to create more in the future. Paignton Zoo Environmental Park is a registered charity. For more information go to www.paigntonzoo.org.uk or ring 01803 697500.